If free motion quilting, and in particular, feather quilting, makes you giddy, then you'll love this new pattern I found at Spring Quilt Market, Minneapolis, 2010. 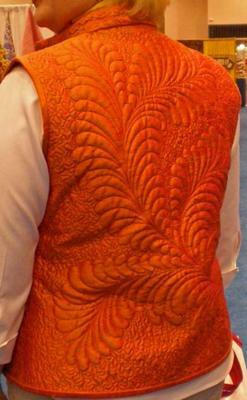 This is simply a STUNNING vest, designed, quilted and worn by Lori Allison of www.the-sampler.com. This version is in a gorgeous orange dupioni silk and features machine quilted feathers on both the front and back...that way you'll look good coming AND going! A very elegant and wearable piece of art! 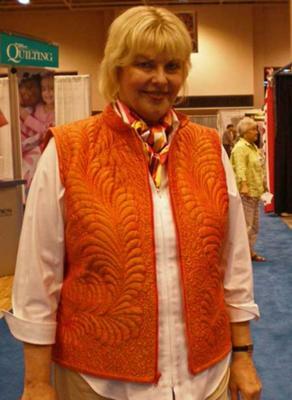 Lori was awarded the first place blue ribbon in the Everyday Wearable category at the IMQA show (May, 2010) for her turquoise vest, again, made in silk dupioni. Lori also designs quilts...for the walls and for the beds. Visit her website to see more of her joyously exuberant designs!